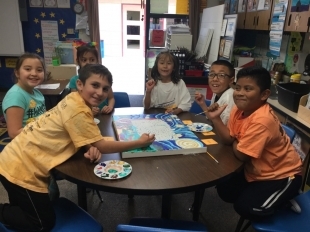 The second-grade students in Celeste Nava's dual immersion class at Valley View Elementary School were busy recently recreating artistic masterpieces. The art materials were awarded to the class as part of a Donorschools.org grant, "Spectacular STEM Art!" "My students have been able to collaboratively create masterpieces by some of our most beloved and celebrated artists -- Diego Rivera, Vincent van Gogh, Claude Monet, Gustav Klimt and Frida Kahlo," Nava said in an email. "Even in times of minimal arts funding, teachers can and do still find creative ways to integrate arts education into the classroom." The paintings will be sold at the school's annual parent auction, raising funds to support other art programs, a technology specialist, classroom supplies and field trips. The money raised at the auctions also helps the school continue its campus-wide events such as its Fun Run, Hootenanny, Talent Show, Multicultural Fair, Science Fair and Dinner with a Scientist. "This is truly a beautiful example of paying it forward, kindness and people giving back," Nava said.